I got this picture of Comet C/2011 L4 PANSTARRS at 8PM on Tuesday, 12 March 2013, about 2 days after the comet’s closest approach to the sun. I couldn’t see it with the naked eye due to haze and glare from the sunset and bright suburban lights, but a six second exposure with a narrow aperture resolved the comet as a faint smudge to the left of the new moon. 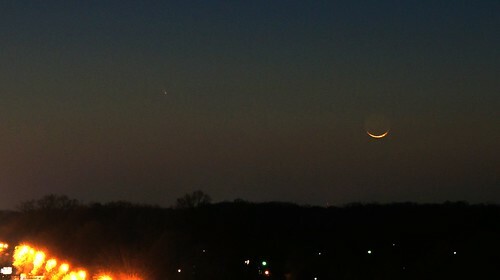 Also check out thisisbossi’s shot of the comet and moon with Lincoln Memorial.